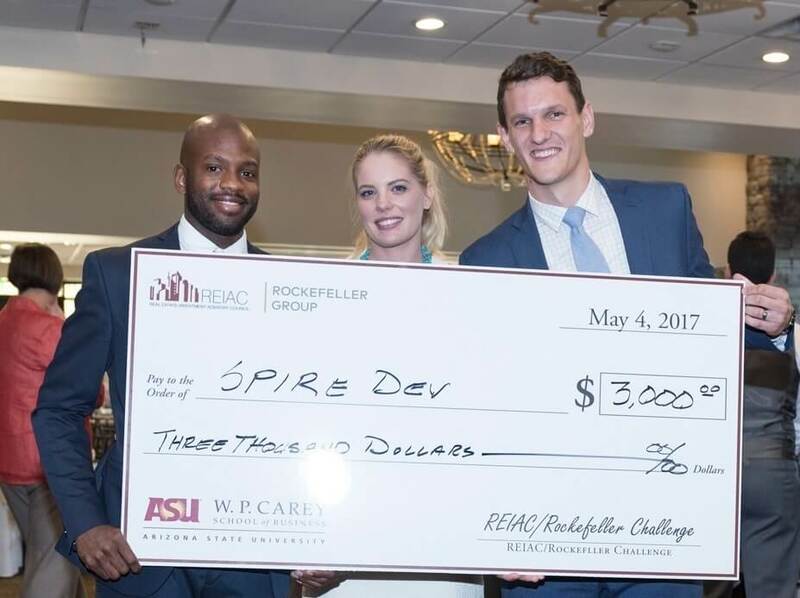 The teams consisting of graduating students from Arizona State University’s W. P. Carey School of Business, Masters of Real Estate Development (MRED) program competed for cash prizes. Spire Development captured the honor, garnering $1,000 each for members Anna Sepic, Jay Van Tussell, and Kyle Trent. This year’s project consisted of a mixed-use development at Dorsey Lane and Apache Boulevard in Tempe. It featured six separate parcels including a new school for the arts; a retail center at the NWC of Dorsey and Apache; retail/office space at the NEC corner of Dorsey and Apache; and three parcels of vacant City of Tempe land. Spire Development’s winning project, Third Space, was a four-phased master plan that included multifamily space of 70 apartments, 50 flats, 43 lofts, 16 studios, and 13 townhomes; a new school for the arts; a restaurant; a gym; and retail, office, and community space. Sepic said the biggest challenge the team faced was making the financials work. The greatest satisfaction of participating in the MRED-REIAC/Rockefeller Group Challenge? Crescendo Development – The Beat on Dorsey, a project to attract tech-savvy millennials in a transit-oriented walkable environment with public art installations and 7,000 square feet of open pavilion space. Collage Development – Collage at Dorsey Station, a project that’s the “character and soul of a community; a project that inspires us,” according to the presenters. It features dining, retail, office, a school for the arts, and artist loft space. CED Development – Joule: An Innovation District. This master-plan design is intended to “build off the momentum of the light rail and Tempe streetcar.” It is designed for those in the trade classes, engineering, and software design. It features creative space, maker space, co-working space, row houses, condos, and contemporary restaurants. Each team was allotted 10 minutes to present a development solution followed by questions from the audience. Audience members chose the winning team immediately after the presentations. In addition to sponsoring the annual Challenge, REIAC awards two $2,500 scholarships to MRED students that have a financial need and want to pursue real estate careers in Arizona after they graduate.